Continuity mistake: In the scene where Mercedes confronts Edmond for the second time and he finally admits who he is, she makes a point of showing him the string still tied to her ring finger. Two scenes later, it is also visible when she is still asleep in bed. However, in the scene after she has been shot and everyone is tending to her, her left hand is shown several times and there is no string. Considering her statement that it would, "never leave my finger," and her later reiteration of that in addition to, "and it never has," for the 16 years she was separated from Edmond, it is strange that it has suddenly disappeared. Factual error: When Edmund Dantes is promoted to Captain, we clearly see a brass diving helmet on a shelf in the office. Augustus Siebe's hard hat diving dress wasn't invented until 1819, and didn't appear as in the movie until at least 1837. Factual error: Napoleon continually addresses the British officer on Elba as 'Lieutenant' Graypool despite his displayed sergeant's stripes. Napoleon is a professional soldier who has fought the British and lived with them for some time - he is unlikely to be confused by British rank insignia. Continuity mistake: When Edmond goes to Fernand for help, they end up fighting in something similar to the living room (it's quite a big room). After the police take Edmond away, he throws his sword, but it hits the fake wall that is supposed to be the living room behind him and it's easy enough to tell that the room behind him is not real. Revealing mistake: Very near the end of the movie, when Edmond and Fernand are about to start fighting, a power line is visible in the background as the camera pans over from Edmond to Fernand's back. 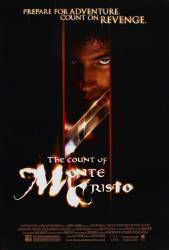 Continuity mistake: The Count of Monte Cristo asks Mercedes to dance a waltz. What they then dance is nothing like a waltz. Other mistake: In the first scene at Marseilles, the shipping company's sign reads "Morell & Co. Shipping", but the owner's name is spelled "Morrel". French spelling didn't vary at the time, since the French Academy had by then been in place for some 200 years. And even if a businessman might not spell everything correctly every time, he would at least know how to spell his own name right and would make sure it is so on such a commercial sign. Albert Mondego: Who are you, and why are you doing this? Luigi: We are bad men, and for the money. Director Kevin Reynolds shot two versions of the scene with Villefort and Monte Cristo, one in which the pistol is loaded and one with the pistol not loaded. The original cut of the film had the loaded pistol, but it was changed after test audiences expressed their preference for an unloaded pistol scenario, thus having Villefort be forced to go to prison and suffer as Edmond had.